Anthrax lethal toxin (LT), produced by the Gram-positive bacterium Bacillus anthracis, is a highly effective zinc dependent metalloprotease that cleaves the N-terminus of mitogen-activated protein kinase kinases (MAPKK or MEKs) and is known to play a role in impairing the host immune system during an inhalation anthrax infection. Here, we present the transcriptional responses of LT treated human monocytes in order to further elucidate the mechanisms of LT inhibition on the host immune system. 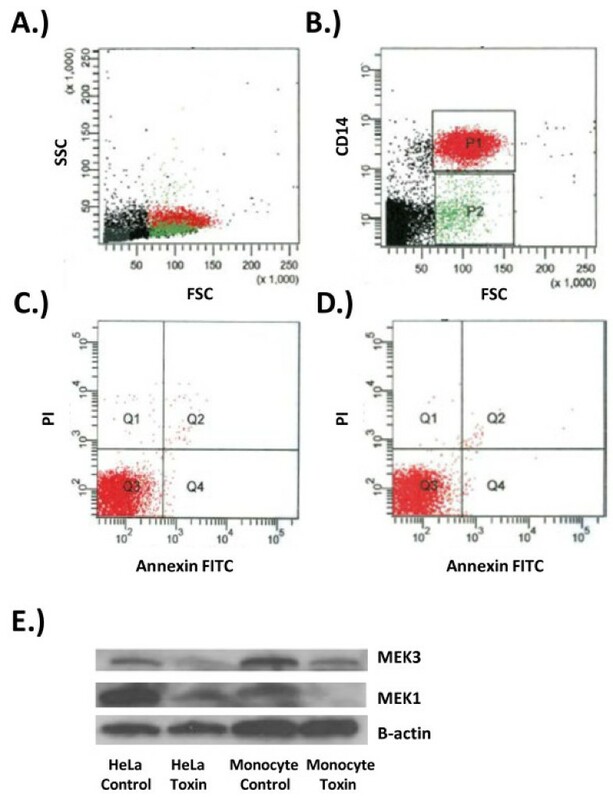 Western Blot analysis demonstrated cleavage of endogenous MEK1 and MEK3 when human monocytes were treated with 500 ng/mL LT for four hours, proving their susceptibility to anthrax lethal toxin. Furthermore, staining with annexin V and propidium iodide revealed that LT treatment did not induce human peripheral monocyte apoptosis or necrosis. 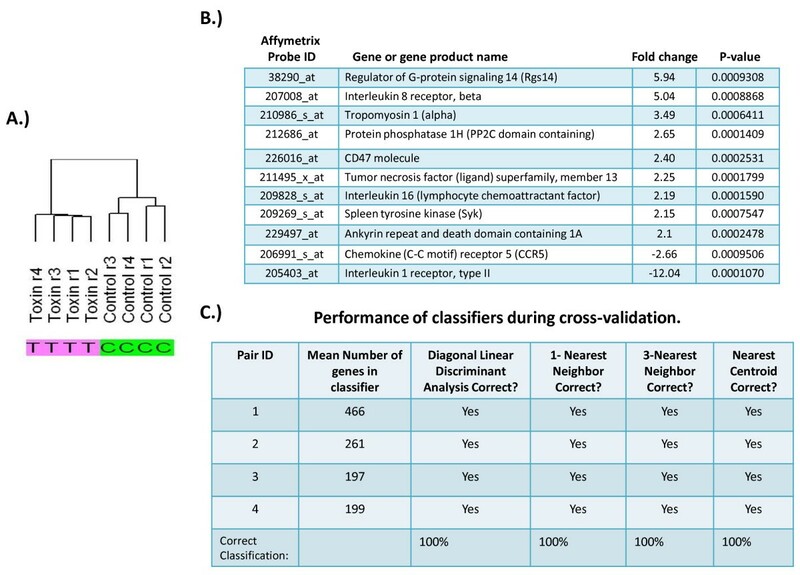 Using Affymetrix Human Genome U133 Plus 2.0 Arrays, we identified over 820 probe sets differentially regulated after LT treatment at the p <0.001 significance level, interrupting the normal transduction of over 60 known pathways. As expected, the MAPKK signaling pathway was most drastically affected by LT, but numerous genes outside the well-recognized pathways were also influenced by LT including the IL-18 signaling pathway, Toll-like receptor pathway and the IFN alpha signaling pathway. Multiple genes involved in actin regulation, signal transduction, transcriptional regulation and cytokine signaling were identified after treatment with anthrax LT.
We conclude LT directly targets human peripheral monocytes and causes multiple aberrant gene responses that would be expected to be associated with defects in human monocyte’s normal signaling transduction pathways and function. This study provides further insights into the mechanisms associated with the host immune system collapse during an anthrax infection, and suggests that anthrax LT may have additional downstream targets outside the well-known MAPK pathway. Bacillus anthracis, the causative agent of anthrax, is a gram-positive bacterium that is naturally found in the soil, and rarely affects the human population. Unfortunately, deliberate dissemination of anthrax spores is capable of delivering a highly potent and lethal air-borne bioterrorist agent, as documented in the 2001 U.S. anthrax attacks. Inhalation anthrax is a highly fatal, acute disease characterized by a rapid onset of systemic shock and ultimately death. The most virulent strains of B. anthracis contain two plasmids, pXO2 and pXO1, encoding an antiphagocytic poly-D-glutamic acid capsule and three exotoxins: lethal factor, edema factor and protective antigen. Protective antigen is an 83 kDa protein that is known to bind to two host cell receptors, TEM-8 and CMG-2, facilitating the entry of edema and/or lethal factor into host cells. Lethal factor is a 90 kDa zinc-dependent metalloprotease that cleaves the N-terminus of mitogen-activated protein kinase kinases (MAPKKs or MEKs)[4, 5]. Edema factor is an 89 kDa adenylate cyclase that increases intracellular cAMP levels. Previous studies using anthrax animal models have documented resistance to anthrax lethal toxin (LT) through depletion of host macrophages, suggesting that these cells play a critical role in anthrax LT induced lethality[7, 8]. LT has also been shown to suppress cytokine responses by peripheral blood mononuclear cells, induce macrophage apoptosis, and prevent monocyte proliferation and differentiation[1, 9, 10]. Inhalation anthrax cases present clinical manifestations indicative of host immune collapse in humans and in nonhuman primate studies[11–13]. However, more recent studies investigating human monocytes and macrophages have suggested human alveolar macrophages are resistant to LT, and undifferentiated human monocytic cell lines are resistant to LT-induced death[10, 14]. LT’s targeting of human monocytes/macrophages could help to explain the rapid onset of fatal symptoms and host demise during an inhalation anthrax infection, but the exact effects LT exerts on human peripheral monocytes, along with the mechanisms underlying the impairment of the host immune cell’s responses, have yet to be fully determined. Previous studies investigating LT treated murine macrophages have shown a broad range in transcriptional effects induced by LT. These studies concluded LT-induced changes in macrophage inflammation, signaling, and transcription factors, along with changes in the immune response by macrophages. This study discovered the down regulation of CD-137 after LT treatment, shown to play a role in monocyte proliferation in response to LPS, and up regulation of plasminogen activator inhibitor type I, which results in fibrin deposits, massive imbalances in coagulation, and, in some instances, multi-organ failure[15, 16]. Another study has measured the transcriptional responses of THP-1 cells after B. anthracis spore exposure, finding toxigenic B. anthracis strains suppress the cell signaling responses to infection. Blood monocytes are mononuclear cells that play a major role in the host immune response through regulation of inflammatory responses, secretion of cytokine and antimicrobial factors, and direct pathogen clearance. Monocytes are derived from monoblasts in the bone marrow, and circulate in the blood for 1-2 days before they migrate into tissues where they replenish the macrophage and dendritic pools[19–21]. Here, we determined human monocyte susceptibility to LT by demonstrating cleavage of MEKs, and utilized Affymetrix GeneChip® Human Genome U133 Plus 2.0 Arrays in order to identify additional mechanisms of LT impairment on the transcriptional responses of human peripheral monocytes. The arrays contained 54,675 probe sets representing over 22,000 of the best characterized human genes, providing extensive insights into the mechanisms behind LT induced dysfunction of human peripheral monocytes. This study is the first to determine direct human monocyte susceptibility via cleavage of MEKs, along with the analysis of the transcriptional responses, to anthrax LT. The mechanisms of LT impairment on human peripheral monocytes will help elucidate the roles monocytes contribute during the host immune system collapse documented during an anthrax infection. The transcriptional analysis will serve to not only unravel the mechanisms behind the rapid onset of death in anthrax victims, but will also potentially provide new targets for controlling inflammation and enhancing host defense. In order to first determine monocyte cell purity, isolated cells were analyzed using flow cytometry and gated using forward and side scatter, along with the monocytic marker, CD14. It was found that monocytes were isolated with a >85% purity (Figure 1A and1B). Because previous reports have documented LT induced cell apoptosis, it was important to assure the transcriptional response of LT treated monocytes were independent of apoptosis. This was assured by the analysis of the necrosis and apoptosis markers, propidium iodide (PI) and annexin V, on human peripheral monocytes. Nearly all (99%) human peripheral monocytes showed no evidence of necrosis or apoptosis after a 4 h treatment of LT (Figure 1C and1D). There has been some conflicting data suggesting monocytes, along with monocyte-derived cells, are not susceptible to the actions of anthrax LT. One study utilized human monocytic cell lines and found that undifferentiated monocytic cells did not undergo LT-induced cytotoxicity, while the differentiated cells were susceptible. Another study investigating human alveolar macrophages (AM) found that these cells were relatively resistant to the actions of LT. It was ascertained that LT failed to suppress human AM cytokine responses, cleave MEKs, and induce apoptosis. Monocyte purity, apoptosis, and susceptibility to LT. Red = CD14+ monocytes. Green = CD14-lymphocytes. A.) Forward and side scatter analysis of purified fixed human monocytes showing the monocyte population as compared to total population. B.) CD14 Pacific Blue and forward scatter analysis of fixed purified human monocytes showing >85% monocytes. C.) PI and annexin-FITC analysis of CD14 + monocytes after a 4 h incubation showing 99.0% viable cells indicated in quadrant 3. D.) PI and annexin-FITC analysis of CD14 + monocytes after a 4 h LT treatment showing 99.1% viable cells indicated in quadrant 3. HeLa cells or human monocytes were left untreated or treated with 500 ng/mL LT for 4 h at 37°C. Samples were lysed, run on SDS-PAGE, transferred to PVDF membrane, and probed with indicated antibodies. Both MEK3 and MEK1 were cleaved by LT while control cells showed no MEK cleavage. β-actin loading controls show equivalent loading of both control and LT treated cells. In order to explore the actions of LT on human peripheral monocytes, a Western Blot analysis was performed and MEK1, along with MEK3, cleavage was determined after a 4-hour treatment with LT. Human peripheral monocytes were found to be susceptible to the actions of LT as evidenced by cleavage of MEK1 and MEK3 (Figure 1E). HeLa cells were used as a positive control and β-actin was used to assure equal loading controls. We conclude that human peripheral monocytes are a direct target of anthrax LT.
Human peripheral monocytes were treated with LT or media alone, and microarray analysis was performed using four biological replicates from healthy volunteers. A total of 8 microarray hybridizations were employed and analyzed on Affymetrix Gene Chips®(HG U133 plus 2.0). The chips contained 54,675 probe sets and identified multiple differentially regulated pathways and genes by human peripheral monocytes after LT treatment. Unsupervised hierarchical analysis was used to assess the noise in the array experiments. First, probe sets whose signal intensity varied most in the data set were selected by applying a variation filter. Probes sets that displayed a coefficient of variation of greater than 0.5 were subjected to hierarchical analysis. The clustering dendrogram showed the major node of separation between control and LT treated samples (Figure 2A). Unsupervised microarray analysis. A.) Hierarchical clustering dendrogram showing similarities between expression patterns within each condition. Specimens were paired based on donor, using 4 separate donors as indicated in replica r1 through r4. B.) Significant genes (p < 0.001) up or down regulated after LT treatment, along with their fold change, p-value and probe ID. C.) Leave-one-out-cross validation was used to calculate mis-classification rate that yielded a 100% correct classification between pairs. To identify specific genes responsive to LT treatment, a paired t-test (by donor) was performed at a significance threshold of p < 0.001. Genes specified by 820 probe sets were found to be significant among the treatment groups (Table 1). The hierarchical cluster pattern of the significant probe sets is shown (Figure 3A). Of these probe sets, multiple gene products known to play a role in monocyte function were discovered (Figure 2B). The ability of probe sets significant at p < 0.001 to function as a classifier between treatment groups (LT treated vs. control) was established by leave-one-out-cross-validation and Monte Carlo simulations. Using 4 different prediction models, the classifier performed flawlessly. Of the significant genes identified, many are known to play a role in monocyte function (Figure 2C). Supervised microarray analysis. A.) Hierarchical cluster analysis showing the 820 probe sets which were differentially expressed at the 0.001 significance level. The arrays clustering on the left are from control samples, whereas the cluster on the right shows the LT treated samples. Up-regulated genes are shown in red and down-regulated genes are shown in blue. B.) Biocarta pathway analysis showing the pathways most significantly affected by LT, along with the number of genes and p-value within each pathway that were affected. C.) Correlation of genes altered after treatment with anthrax LT using microarray analysis versus RT-PCR. Spearman correlation coefficient = 0.885. Using the Gene Set Expression Comparison Analysis, as implemented in BRB Array tools, the Biocarta pathways that were associated with the differentially regulated genes were identified. Over 60 differentially regulated pathways were discovered in monocytes in response to LT treatment. As expected, the most significant pathway affected by LT treatment was the MAPK signaling pathway, with the p38 MAPK signaling pathway being most impacted with 103 genes affected (Figure 3B). 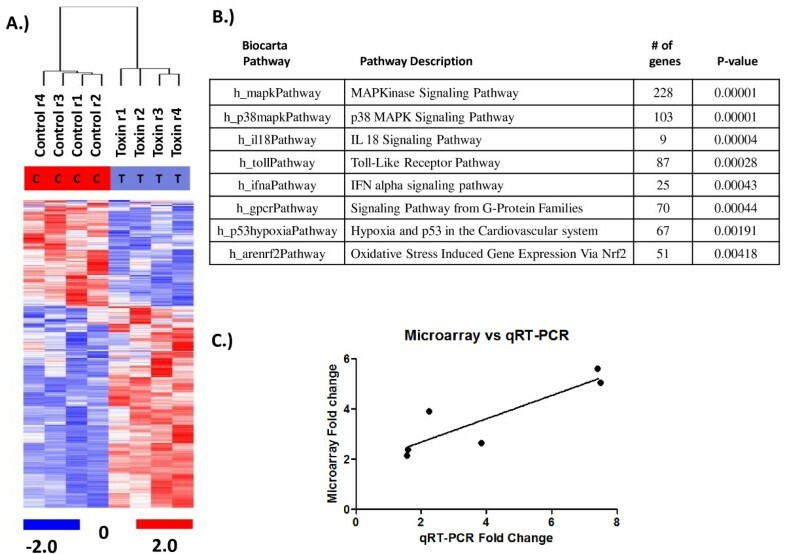 Additional pathways altered by LT at the p < 0.001 significance level included the IL-18, Toll-Like Receptor, IFN alpha, and G-Protein Family signaling pathways. It is interesting to note that a previous study measuring the transcriptional response of human alveolar macrophages to anthrax spores detected an activation of the TLR pathways, and our results indicated anthrax LT targets 87 genes within the TLR signaling pathway (Figure 3B). RGS14 is a protein involved in the regulation of G-protein signaling through attenuation of G-protein heterotrimer signaling, thereby inactivating this signaling cascade. The Affymetrix microarrays revealed that RGS14 expression in LT treated monocytes showed a 6 fold increase in expression (Table 2). This is a potentially significant finding in that RGS14 inhibits G-proteins important for chemotaxis. Therefore LT could be impairing chemotaxis not only by blocking Hsp27 phosphorylation through disruption of the p38 pathway, but also by causing over-expression of RGS14, thereby inhibiting G-protein mediated signaling required for actin-based motility. 1 Calculated fold changes compared to mock treated samples. RGS14 expression is down-regulated during the maturation of monocytes to dendritic cells and over-expression of this G-protein regulator would be expected to block monocyte maturation. RGS14 levels are also known to decrease in dendritic cells exposed to Leishmania major or Toxoplasma gondii, suggesting that RGS14 downregulation may be an important step in a normal immune response, and up-regulation of RGS14 by LT could be contributing to LT’s immunosuppressive effects. Three chemokine receptors were also altered after LT treatment, suggesting that LT may be inducing functional defects in monocyte response signaling. IL-8 receptor beta (CXCR2) was up-regulated after LT treatment (Table 2). CXCR2 transduces signaling through a G-protein activated second messenger system. This receptor is important for monocyte transendothelial migration, and up-regulation of CXCR2 could serve to enhance the delivery of monocytes to tissues. Anthrax spores must be phagocytosed by macrophages in order to germinate into viable bacteria. An increase in the macrophage pool may aid in a reservoir for increased germination of viable bacteria. IL-1 receptor type II (IL-1R2), was found to be markedly down-regulated. IL-1R2 is a decoy receptor for IL-1 that functions either at the cell surface or in a soluble form. The decreased expression of the decoy receptor would presumably increase IL-1a levels and increase the febrile response of the host potentially at least in part explaining the high fever that commonly accompanies systemic anthrax. CCR5 is a receptor for the monocyte chemokines RANTES and MIP. The down-regulation of CCR5 by LT could reflect an inability of toxin-treated monocytes to differentiate into macrophages (Table 2). During the early stages of infection, macrophages play a critical role in assisting B. anthracis pathogenesis by providing a place for bacteria germination from their spore form to viable bacteria. An increase in monocyte trafficking to allow an increase in spore uptake and subsequent germination would prove beneficial for B. anthracis. During later stages of infection, after release of viable bacteria, limiting monocyte differentiation to macrophages would assist in preventing clearance of viable bacteria. In addition to an alteration in the chemokine response by LT, an additional enzyme, heparanase (HPSE), was found to be decreased in LT-treated human monocytes. This enzyme is an endoglycosidase that degrades heparin sulfate, resulting in disassembly of extracellular barriers required for cell migration. Heparanase has also been postulated to play a role in inflammation and our results showed a 2.6 fold decrease in heparanase gene expression (Table 2). One study has concluded that an in vivo siRNA against heparanase, along with an inhibitor of its enzymatic activity, results in a diminished inflammatory response. Thus LT- mediated inhibition of heparanase expression could also contribute to the inhibition of the host immune response during an anthrax infection. An external verification method using quantitative real-time PCR was utilized to confirm the microarray data. The eight genes corresponding to RGS14, IL8RB, TLR5, PPM1H, CD47, SYK, CCR5, and IL1R2 were chosen for microarray confirmation in monocytes. CCR5 and IL1R2 were confirmed to be down-regulated at 4 h after LT treatment, reinforcing the microarray data, while the other six genes were up-regulated, again confirming the microarray data (Table 3). A correlation curve was plotted (Figure 3C) and analyzed, showing a linear relationship between the microarray results and RT-PCR with a correlation coefficient of 0.885. Results were performed in duplicates and fold values were normalized to GAPDH. To exclude the possibility the lymphocyte contamination might be contributing to our microarray findings, a higher purity monocyte population (98% purity), obtained by adherence followed by washing off non-adherent lymphocytes, was treated with 500 ng/mL LT for 4 h and gene expression was assessed using real-time PCR. These experiments verified 3 genes to be increased after LT treatment: RGS14, TLR5, and CD47 (1.21-1.70), as observed by the microarray of suspended cells. These findings suggest that the changes in messenger RNA observed are primarily contributed by monocytes, but we cannot entirely exclude a contribution by lymphocytes. 1 Calculated fold changes comparedtomock treated samples. Our investigations show human peripheral monocytes are susceptible to the actions of anthrax LT and do not undergo LT-mediated cytotoxicity after a four hour toxin treatment. We also find that LT induces changes in several genes involved in previously unidentified pathways including the TLR pathway, IFN alpha pathway, and G-Protein family signaling pathways. The identification of several previously unappreciated gene products including RGS14, IL8 receptor beta, CD47, TNF ligand, IL-16, Syk, CCR5, and IL-1 receptor II adds to our understanding of how LT impacts the immune response. Our pathway analysis reveals that anthrax LT targets multiple normal immune-regulatory pathways that would be expected to protect the host against anthrax infection. The increase in RGS14 levels and decrease in CCR5, along with IL-1R2, would likely impair monocyte functions and help to facilitate bacteria survival. B. anthracis maintains a selective advantage by impairing the host immune responses, thereby allowing for invasion and dissemination of the highly fatal bacilli. Our findings encourage further investigations into how these pathways converge functionally to impair normal monocyte function, along with providing new insights into the regulation of the host defense system and inflammation. Whole blood was collected by venous puncture from healthy human volunteers into 8 mL vacutainer tubes containing Ficoll (BD Biosciences). The study followed US Department of Health and Human Services guidelines and was approved by the University of Florida Institutional Review Board. Whole blood was incubated with a monocyte negative selection antibody (Stem Cell Technologies) for 20 min., centrifuged 1700 × g for 25 min at RT, no brake over Ficoll, re-suspended in 10 mL RPMI (Mediatech) complete media, centrifuged at 250 × g for 9 min. to remove platelets, and re-suspended to 7-9 × 105 cells/mL in RPMI. Monocytes were inverted at 37°C with 500 ng/mL LF and 500 ng/mL PA for 4 h. Additional qRT-PCR experiments were performed using higher monocyte purities (98%), obtained by first using a negative selection antibody cocktail (Stem Cell Technologies) isolation technique, followed by plastic adherence for 4 h, as described previously. LF and PA were purified as previously described. Briefly, Bacillus anthracis culture media was filtered through a 0.22 uM filter, followed by diethylaminoethyl cellulose (DEAE) anion exchange chromatography. The toxins were then subjected to gel filtration and hydrophobic interaction fast protein liquid chromatography (FPLC) and highly purified toxin components were confirmed by Coomassie Blue staining. Monocytes were inverted at 37°C with 500 ng/mL LF and 500 ng/mL PA for 4 h, stained with CD-14 Pac Blue (BD Biosciences), Annexin-V-Fluorescein and propidium iodide (Roche). The cell population was gated first for CD14-Pac-Blue followed by analysis of the relative amount of Annexin (FL1) and PI (FL2) using flow cytometry FACScan (BD), and analyzed by FCS Express (De Novo). Purified monocytes were incubated at 37°C with 500 ng/mL lethal toxin for 4 h. Cells were lysed, ran on a 10% SDS-PAGE gel (Pierce), transferred to a PVDF membrane (Bio-rad) and probed for MEK1 (Upstate). Membranes were then stripped and probed for MEK3 (Santa Cruz). β-actin (Sigma) was used to check consistent loading amounts. Purified monocytes from 4 healthy volunteers were incubated at 37°C with media alone or with 500 ng/mL LT for 4 h. Total RNA was collected using RNAeasy mini kit (Qiagen) and RNA quantity and quality was assessed using NanoDrop (Thermo Scientific) technology. 100 ng total RNA was labeled using Affymetrix GeneChip® 3' IVT Express Kit for each replicate. Amplified labeled RNA was purified, fragmented, then hybridized for 16 h on Affymetrix GeneChips® (HG U133 plus 2.0) representing approximately 22,000 well-characterized human genes. Arrays were washed using Affymetrix GeneChip® Fluidics Station FS450 and scanned using GeneChip® Scanner 3000 7 G.
Low-level analysis was performed using dChipmodeled-based expression matrix (dChip 2007 (DNA-Chip Analyzer), Build date: Jan 4, 2008). Unsupervised analysis - probes sets whose hybridization signal intensity exhibited a coefficient of variation of greater than 0.5 were analyzed by unsupervised hierarchical cluster analysis using algorithms implemented in dChip. Supervised analysis - significant probe sets between the treatment groups were identified using a paired t-test (by donor) at a significance threshold of p < 0.001. Leave-one-out-cross-validation using 4 prediction models was used to test the ability of probe sets significant at p < 0.001 to distinguish between the treatment groups. Microarray analyses were done using dCHIP and BRB-ArrayTools by Richard Simon (http://linus.nci.nih.gov/BRB-ArrayTools.html). The microarray data for this study was deposited in the National Center for Biotechnology Information (NCBI) Gene Expression Omnibus (GEO) with accession numbersGSM848717 through GSM 848724. The microarray data is also available in a series with accession number GSE34407. RNA was collected using RNAeasy mini kit (Qiagen), quantitated using a Nanodrop system (Thermo Scientific), and 233 μg total RNA was used for cDNAsynthesis using SuperScript III First-Strand Synthesis (Invitrogen). cDNA was quantitated using SYBR Green JumpStart TaqReadyMix (Sigma) and 10 mM forward and 10 mM reverse primers were used for each indicated reaction. Primers used were as follows ACTB-F TCACCGAGCGCGGCT,ACTB-R TAATGTCACGCACGATTTCCC,GAPDH-F GGTGAAGGTCGGAGTCAACG, and GAPDH-R AGAGTTAAAAGCAGCCCTGGTG. All other primers are listed in Table 2. Reactions were run on the MJR Opticon Continuous Fluorescence detector (Bio-Rad) and analyzed with Opticon Monitor Software 1.08 (Bio-Rad). We thank Dr. Lyle Moldawer for his guidance and assistance in the flow cytometry analysis. The study was supported by the National Institutes of Health RO1AI064891. Publication of this article was funded in part by the University of Florida Open-Access Publishing Fund. KC performed the experiments, analyzed data, interpreted study, drafted, and wrote the manuscript. CL performed the gene expression profiling, biostatistical analysis, and helped design the study. SZ participated in the study design and assisted with experiments. GS participated in the design and interpretation of the study, as well as edited the manuscript. HB participated in the design and analyses of the study. CQ supplied the purified toxin and assisted in data interpretation. FS conceived the study and participated in the design and coordination, as well as edited the manuscript. All authors read and approved the final manuscript.